Valentine’s Day is usually a day we imagine we’ll be celebrating together with someone we love. You plan a romantic dinner, pick up some flowers and maybe a last minute gift on the way to their door. But if you like to plan ahead or your loved one is currently living far away, it’s not too early to think about special gift suggestions from Maisie Jane’s to pick up in Chico or ship wherever you want. I have three ideas for you today but enjoy a ramble through our online store and I know you’ll find many more! 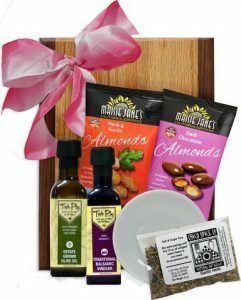 The first time I saw the Bob Mabrey Cutting Board and sweet little dipping dish in this gift set, I fell in love! My sweetheart and I really enjoy good fresh baked bread dipped in nicely seasoned balsamic vinegar and oil, and in this set you’ll find everything you need except the bread: Triple Play Estate Extra Virgin Olive Oil, Triple Play Traditional Balsamic, Chico Spice Garlic Herb Season Packet, and Maisie Jane’s Herb & Garlic Almonds, and Dark Chocolate Almonds. Delicious choices for your romantic dinner and a beautiful gift you’ll enjoy for years to come. 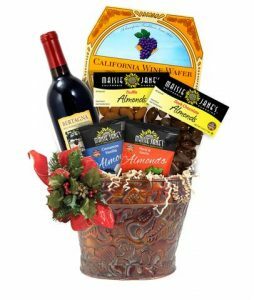 One of my very favorites is the Perfect Wine Basket because it’s filled with a delightful assortment of treats to add to a romantic dinner, and it comes in an attractive pail that could be reused for a potted plant or other purposes. 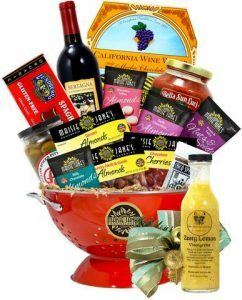 Inside, your sweetie will find Bertagna Son Kissed Vineyard’s Barbera Wine, California Wine Wafers, Maisie Jane’s Cinnamon Vanilla Almonds, Country Herb & Garlic Almonds, Dark Chocolate and Chocolate Truffle Almonds. Such a nice combination! We all know the way to a man’s heart is to cook him a delicious dinner. But do you know the way to a woman’s heart? 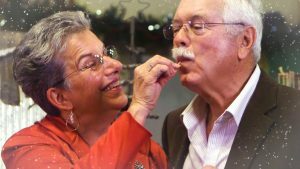 The same thing—cook for her! In this large, colorful pasta colander you’ll find everything to make the meal special: Penna Sicilian Olives, Mooney Farms Pasta Sauce, Lundberg Farms Rice Pasta, Bertagna Son Kissed Vineyards Sangiovese wine, Wine Wafers, Chico Spice’s Garlic & Herb blend, Maisie Jane’s Country Herb & Garlic Almonds, Tamari Almonds, Chocolate Cherries, Dark Chocolate Almonds, Chocolate Toffee Almonds, and Milk Chocolate Almonds. And it will be bowed, decorated and cello wrapped to make unwrapping this prelude to a Valentine’s Day dinner even more fun! Plan the perfect Valentine’s Day!